This is a great recipe to have up your sleeve as it’s really simple to make and the ingredients are things you’ll probably always have in the fridge. It’s also a really simple way to make chicken a bit more exciting. We have this with new potatoes that have been crushed up and mixed with a little olive oil, mint and chives. Cut the chicken breasts to make a pocket and divide the cheese into the pocket. Wrap the prosciutto around the chicken. Wrap the chicken in cling film. Fry in butter for 2 mins on each side to seal the prosciutto. Cook in oven on 200°c for 15 minutes until the chicken is cooked. 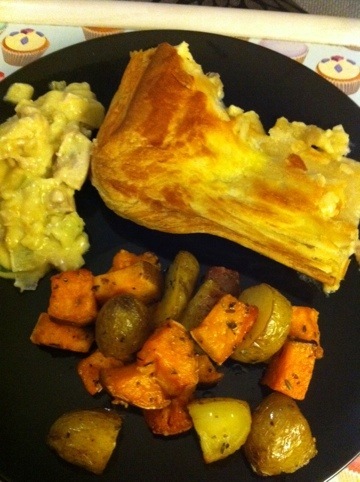 Another recipe passed on to us from a friend, this dish makes a lovely change from the usual chicken and ham pie. This pie does take a bit of effort to make but it’s totally worth it as it’s absolutely delicious. Simply perfect for the upcoming winter months. We often have it with roasted and sweet potatoes but it would be just as good with mash to soak up the sauce! Place wine, stock, bay leaf and garlic in a saucepan and bring to a simmer. Remove leeks and chicken to cool. Melt butter, sprinkle flour and stir for 2 minutes until bubbling. With a whisk, beat in cooking liquid a splash at a time, incorporating all before adding more. Stir in cream and return to the heat. Simmer for 10-12 minutes, stirring often until sauce thickens. Add chicken, leeks,tarragon, mustard and cheddar cheese. Tip into pie dish (20x15cm). Roll pastry to 1/2cm thick and 3cm longer and wider than the dish. Lay pastry on the top and poke 2 holes in to release the steam. Brush pastry with the egg.